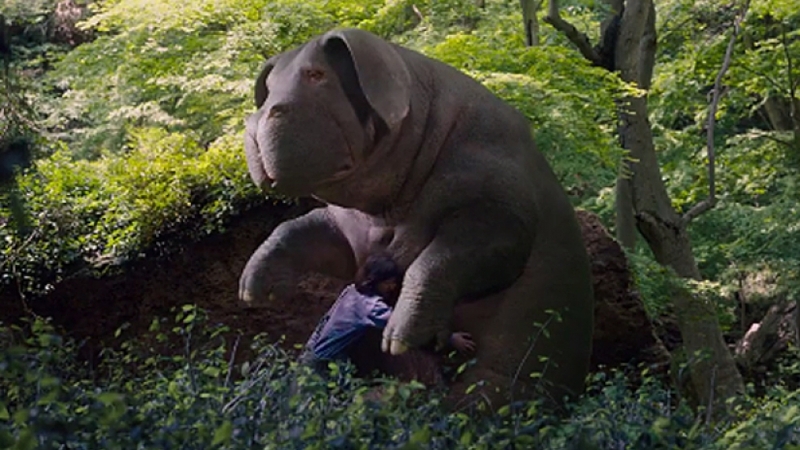 “Okja” is an amazing movie. The premise of raising a giant genetically modified pig is only part of the story. For starters, like “Beasts of No Nation” a couple of years ago, this movie is specifically made for Netflix. That is why I jumped at the chance to see it on the big screen. I saw it at The Alamo Drafthouse in Richardson, Texas. The story centers on a family that chosen to help raise a pig-like creature that for all intents and purposes is nothing more than food. The lead in “Okja” is Mija, played by 13 year old Seo-Hyun Ahn, who gives a remarkable performance that reminded me of Natalie Portman in “The Professional,” wherein a tiny girl gives an outstanding turn that has shades of depth beyond her years. The rest of the cast all give credible performances, especially Paul Dano as Jay, leader of the ALF, an animal activist group that frees creatures from death and the like. Also enjoyable is Jake Gylenhaal as Johnny Wilcox, a pseudo animal activist celebrity who claims to be on the side of good, but turns out to be a wolf in sheep’s clothing. My point of reference comparison would be Kenneth Branagh’s supporting turn in “Harry Potter and “the Chamber of Secrets” as his fraud teacher teacher Gilderoy Lockhart. Also worthy of mention is Lilly Collins as Red, who aids Jay and others members of the ALF. She was good in this, just like her part in the little seen “Rules Don’t Apply” from last year. Also giving commendable support is Steven Yeun as K, a member of the ALF team. Tilda Swinton returns as the antagonist of the story as sisters Lucy and Nancy Mirando. Nancy justifies killing the pigs by saying they just better (expletive) taste good. Her character justifies the slaughter of the pigs by stating supposed facts by referring to their carbon footprint in today’s world. Supposedly, it is Less toxic waste and fewer greenhouse gases. 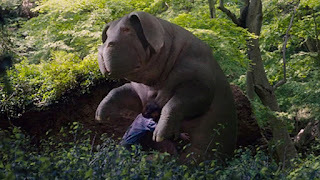 The relationship of Okja and Mija is central to the storyline. They share a special relationship where Mija just whispers what she is saying into Okja’s ear. “Okja” is unrated, but with some brutal deaths near the end, I would give it a PG-13 rating. The violence is not necessary, but it does affect the storyline angle altogether. I really appreciate d this movie, due in part because of the director Bong Joon Ho. He did a great job with 2006s “The Host.” More recently he handled the dystopian train saga “Snowpiercer,” (2013) which a lot of people praised, but to me just an average story. In that tale, it was lead Chris Evans (“Captain America” The First Avenger,” “Push,” “Gifted”) who resides on an endless train ride going around the planet. For comparisons sake, I would liken “Okja” this to either Steven Spielberg’s 1982 masterpiece “E. T.” The Extra Terreststrial” and 1984’s “The Neverending Story.” They each had family fun that bordered on fantasy and the like.